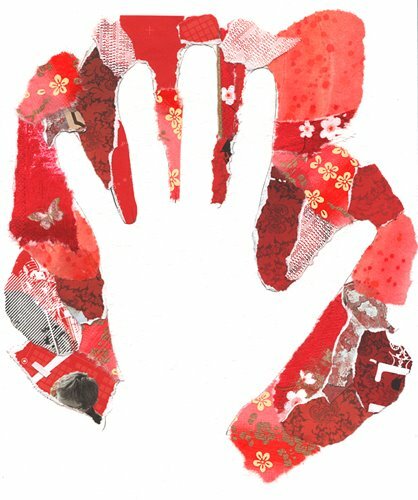 It's for a 'handbook' so this was the best I could come up with ;-) I think I'm going to print out some of his music to collage into the hand part and then probably paint over it a little bit. I'll post it when it's done. Overall the Illustration class was okay. I guess it depends what your expectations are to begin with. It was good to learn some techniques and try new things (which, I'm all about trying new things at the moment so this was very good for me) but I think that could have been done in say 2 classes instead of 4. I'm happy to learn about the technique in class and then do it at home. I don't need to do and hour of collage in class! Anyway, speaking of expectations, what I was really looking for was how to construct a book. Book composition, the pace of the story, how, as the butterfly collector commented somewhere on my blog, how to run pages one into the other. What? I didn't learn that!? But I still enjoyed it, am glad I did it, made some friends and it's good to know Lorette now. She was very sweet and said to email her if we ever have any questions.... i just might take her up on that someday!